Charles John Huffam Dickens (1812 – 1870) was an English writer and social critic who is generally regarded as one of the world's greatest novelists and the creator of some of the world's most memorable fictional characters. During his lifetime Dickens's works enjoyed unprecedented popularity and fame, and by the twentieth century his literary genius was fully recognized by critics and scholars. His novels and short stories continue to enjoy an enduring popularity among the general reading public. Most of Dickens's major novels were first written in monthly or weekly instalments in journals, making them cheap and accessible before being reprinted in book form. Dickens gift for caricature was his forte and he worked intensively on developing arresting names for his characters that would reverberate with associations for his readers. Dickens frequently drew portraits of characters from people he had known in real life. His characters were often so memorable that they took on a life of their own outside his books. 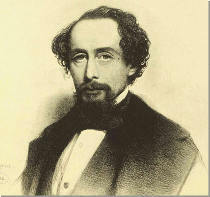 Born in Portsmouth, England, Dickens left school to work in a factory after his father was thrown into debtors' prison. Though he had little formal education, his early impoverishment drove him to succeed. Factory work, prison visits and many other "life" experiences, including working in a law firm, all influenced his later writings. From 1833 he edited a weekly journal for 20 years, wrote 15 novels and hundreds of short stories and non-fiction articles, lectured and performed extensively, and campaigned vigorously for children's rights, education, and other social reforms. In 1836 he married Catherine Hogarth with whom he travelled to the USA in 1842, Italy (1844) and Switzerland (1846). It was in Switzerland that he began work on Dombey and Son (1846–48). This, and David Copperfield (1849–50), mark a significant artistic break in Dickens's career as his novels became more serious in theme and more carefully planned than his early works. In 1857 Dickens fell in love with an actress, Ellen Ternan, a love which was to last the rest of his life. Dickens was 45 and Ternan 18 when he made the decision, which went strongly against Victorian convention, to separate from his wife. Divorce in this time was still unthinkable for someone as famous as he. On 8 June 1870, Dickens suffered a stroke at his home. He never regained consciousness and died the next day, on 9 June. Contrary to his wish to be buried at Rochester Cathedral "in an inexpensive, unostentatious, and strictly private manner", he was laid to rest in Poets' Corner, Westminster Abbey. A printed epitaph circulated at the time of the funeral reads: "To the Memory of Charles Dickens (England's most popular author) who died at his residence, Higham, near Rochester, Kent, 9 June 1870, aged 58 years. He was a sympathiser with the poor, the suffering, and the oppressed; and by his death, one of England's greatest writers is lost to the world." The Pitcairn Islands Philatelic Bureau is proud to commemorate this talented man. Like the Darwin issue, the Philatelic Bureau will, from time-to-time, issue stamps that reflect the life and contribution of some of the world’s most well-known people. 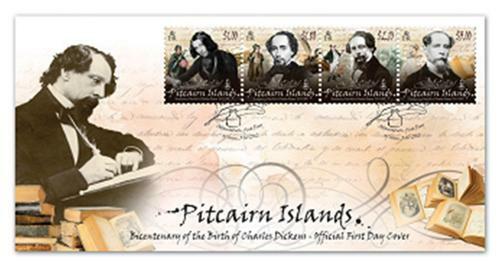 To complement this issue the Philatelic Bureau will send a set of Dickens works to the Pitcairn Islands school. Acknowledgement: Charles Dickens images supplied by the Dickens Museum, London, UK Kyd characters supplied by the Bridgeman Art Library, London UK.